Mistress of all Evil – but with a soft side. Does this sound like somebody you know? Yeah, we thought so. That’s why we conjured up these curved, black Maleficent Horns. When you put the horns on, you’ll either be turning yourself into the dark, evil fairy from Disney’s original 1959 Sleeping Beaut, or into the slightly reformed Angelia Jolie version of the character from the more recent movie – or maybe a little bit of both! Whatever character you choose, you’ll definitely keep all the other guests at the Halloween or costume party guessing what spells and mayhem you’ll conjure up next. 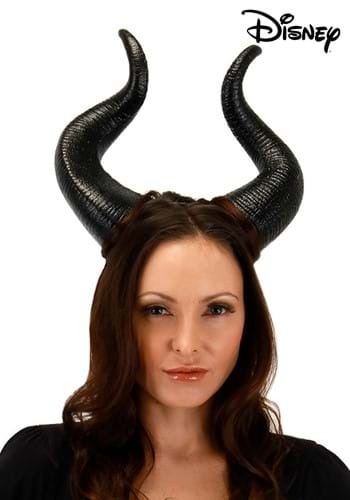 The curved, black horns are made from lightweight foam so you’ll be able to keep them on all night. They stay on with a clear elastic cord that passes around the back of your head and under your hair so they look like they’re a perfectly natural outgrowth of your true nature.